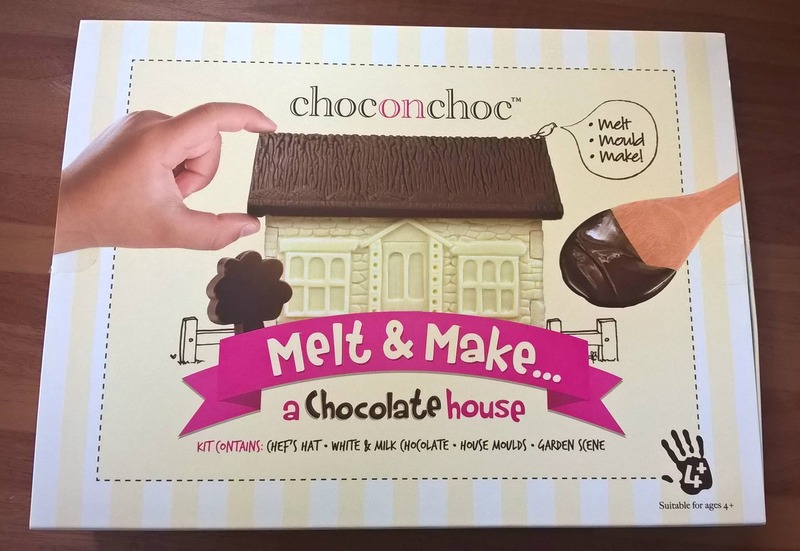 The Melt & Make Chocolate House by choconchoc is available from what2buy4kids and is a high quality, fun to make activity suitable for children aged 4+. 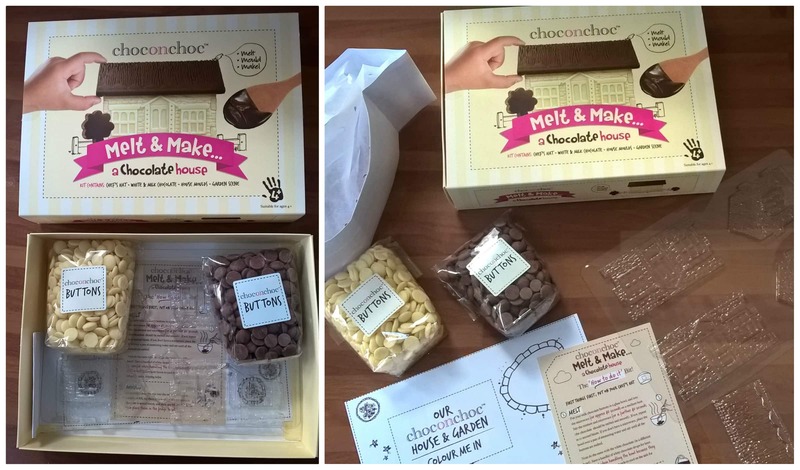 The kit comprises of the house moulds, a garden scene colouring sheet, two bags of good quality chocolate buttons (one white and one milk) and a chef’s paper hat for the child to wear. 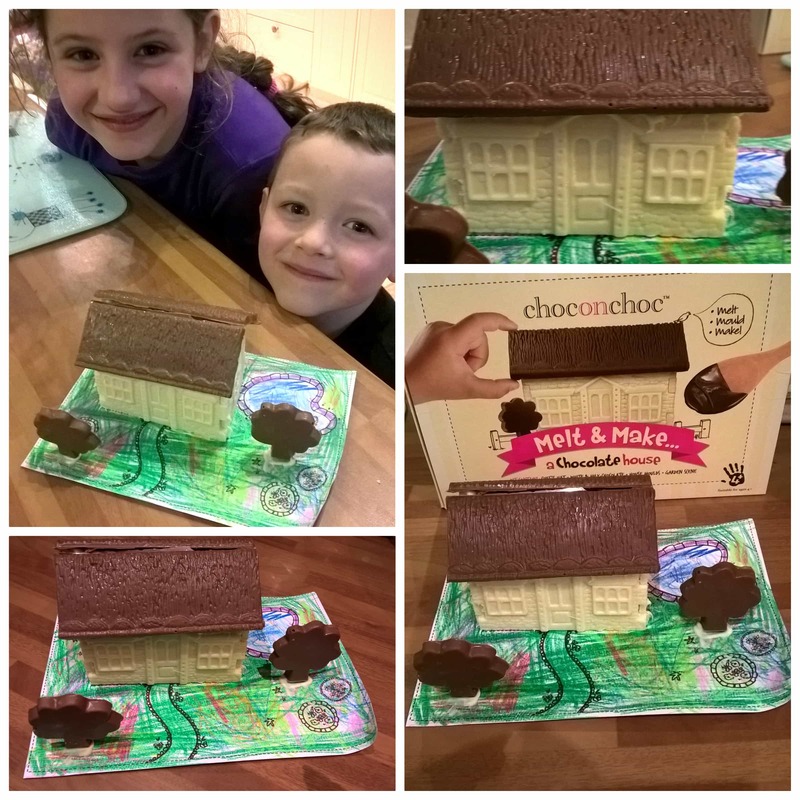 My two children, Miss M age 8 and Mister B age 5, didn’t need any encouragement in participating in this activity, in fact their eye’s lit up in delight at the prospect of building a house out of chocolate which they could then eat! The kit is simple and well thought out to make the job really easy and the first task was to melt the buttons in a bowl. Miss M was in charge of the white ones, and Mister B the milk buttons. I microwaved each of their bowls which they then stirred up to turn the buttons into gooey, runny chocolate. 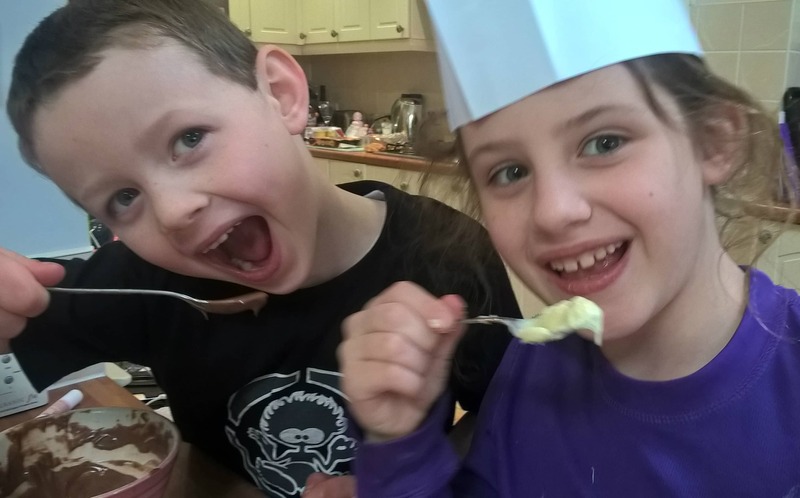 At this point they were both begging to lick their spoons but I told them to fill the moulds first which they eagerly did using a teaspoon to spread the molten chocolate around. Next came the obligatory spoon licking while the moulds were put in the fridge to set. They also used this time to colour in the garden sheet upon which you can rest the finished house on to create a little 3D scene. 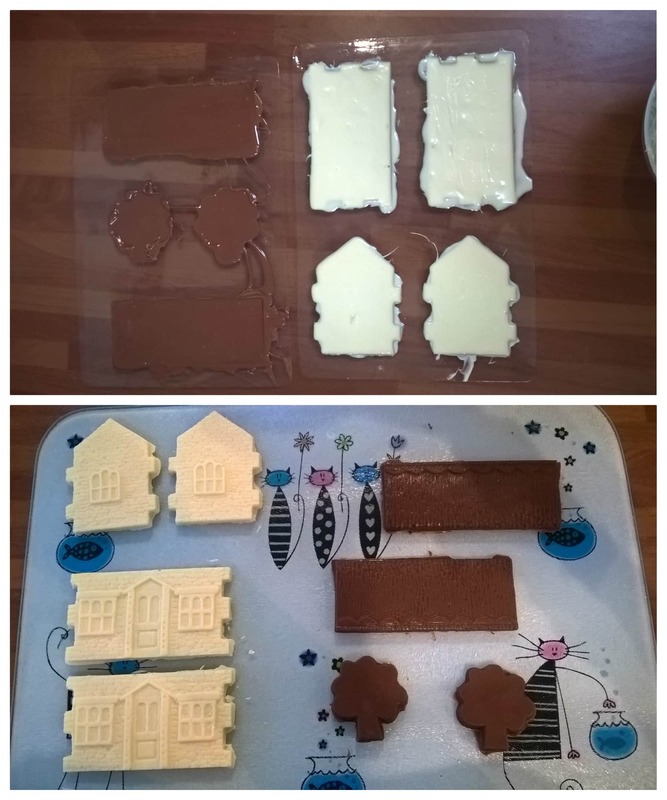 Once the chocolate had set hard, I helped the children to press the shapes carefully out of the moulds to ensure we didn’t break any pieces. I thought the pieceds looked great with a good depth of detail that was really clear and made the house look really effective. We then put them carefully together using a little molten chocolate on our fingers to glue the pieces in place – the kids loved this idea and wanted to put ‘glue’ everywhere! I have to say I’m quite impressed by the finished house, it looked really good for quite minimal effort. The children were really pleased with their finished piece and looked longingly at it wondering when they could start tasting it. 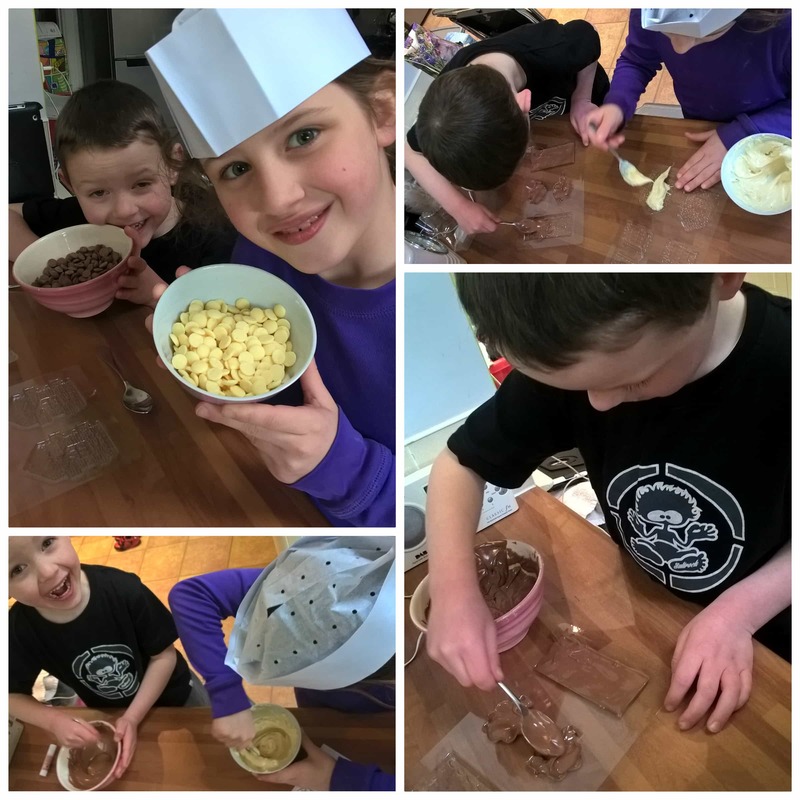 I made them wait until after dinner so that we could admire our handywork for a couple of hours but when we did taste it, it was very good – the bonus of having good quality chocolate in the kit! This kit was a great activity which both of my children thoroughly enjoyed. The set would make great gifts for children at any time of the year, so well worth looking out for. Tom and Jerry Tricky Trap House from Flair is a calamity filled house of traps and jokes that keep Tom and Jerry on the tails of each other as they frantically chase each other around. Tom and Jerry are one of my childhood cartoon memories, always on for five minutes in between other things that always captured and en-tranced both me and my younger brother. 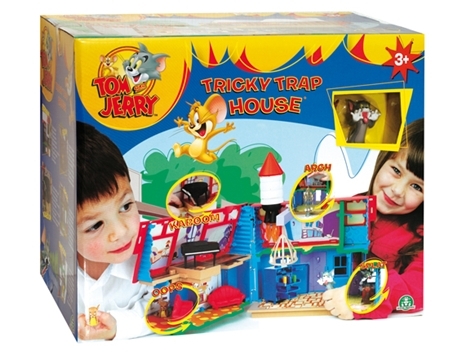 The Tom and Jerry Tricky Trap House is a fold out playset house with 10 mechanical traps along with 2 character figures, Tom and Jerry. Upon hearing about this house I thought it’d be right up Mister B’s street, being the little joker that he is and I wasn’t wrong. His eyes lit up when he saw it and being only vaguely aware of Tom and Jerry beforehand, he soon grasped the idea and had poor Jerry being chased around the house by Tom!! The house opens up to reveal two floors on each side with numerous traps awaiting our two friends Tom and Jerry. I guided Mister B around the various traps available which he found really exciting and couldn’t wait to begin play. I had to be Jerry and he was Tom as he chased me round the house, his favourite was trapping me under the drop down chandelier! There are various traps across the house such as the drop down chandelier, a drop floor shower, a smash through door, a drop leg piano, a pop out fridge, a hidey hole in the roof with drop through floor, a flip up bed, a hide behind sofa and a blast off rocket. Outside there is also a swing seat that once you sit on, it snaps in half!! 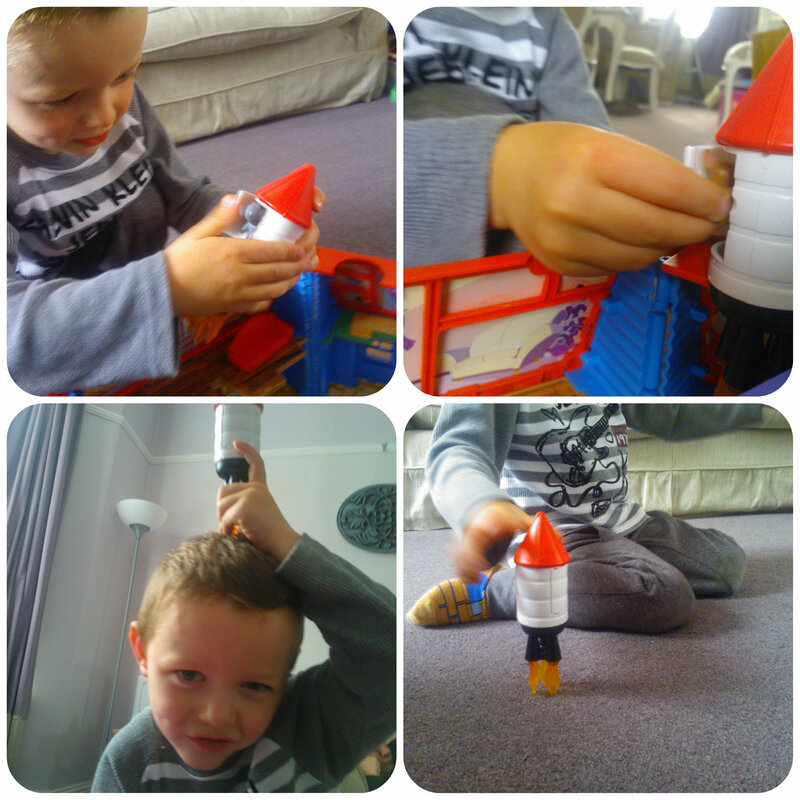 Mister B loved the blast off rocket and that led to hours of fun, putting either Tom or Jerry inside and flying it across the front room. He particularly thought it was hilarious blasting Jerry into space when mummy was being Tom and laughing at me as the rocket flew through the sky as he escaped and poor Tom was stuck on the ground! The quality of the playset is a little less than I was expecting and does look at bit plasticy and cheap. We also had the shower wall fall off which I luckily mended as Mister B is rather fond of letting someone fall through the floor of the shower! Saying that, the quality didn’t bother Mister B who did actually have endless fun with this and has thoroughly enjoyed playing with it as I thought he would. He had a constant grin on his face whilst playing and found it hilarious every time he trapped someone, declaring himself the winner!! 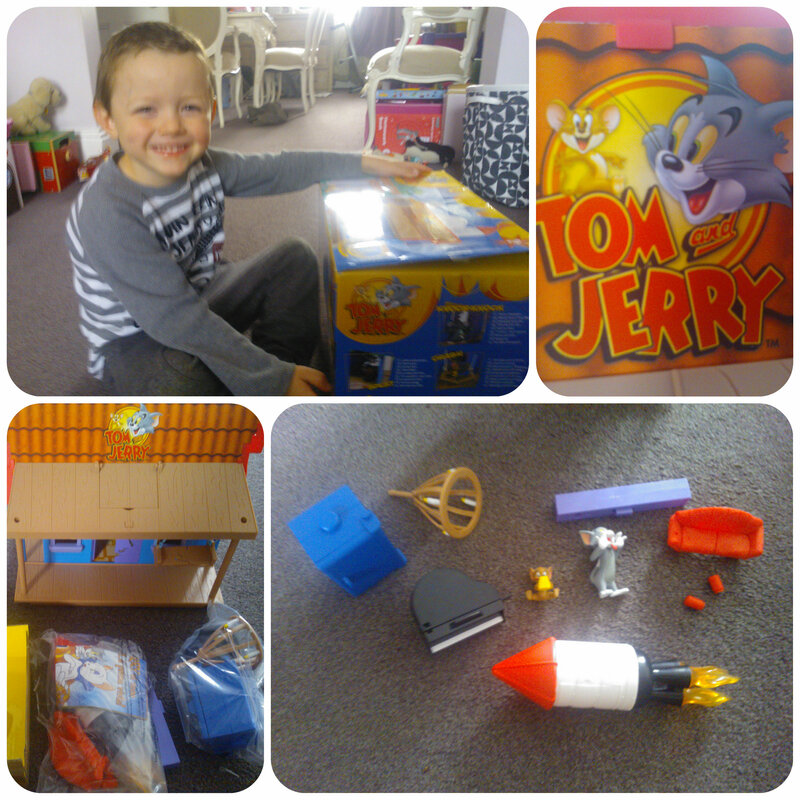 The Tom and Jerry playset has proved to be lots of fun and kept Mister B entertained, I like the way it folds up and it isn’t overly big so doesn’t take up too much room. Make sure you put both Tom and Jerry inside when packing away so they are always there when you want to play. Jerry is quite small so can easily get mislaid amongst other toys. Retailing around the £24.99 mark, I guess it’s a fair price for what you get. 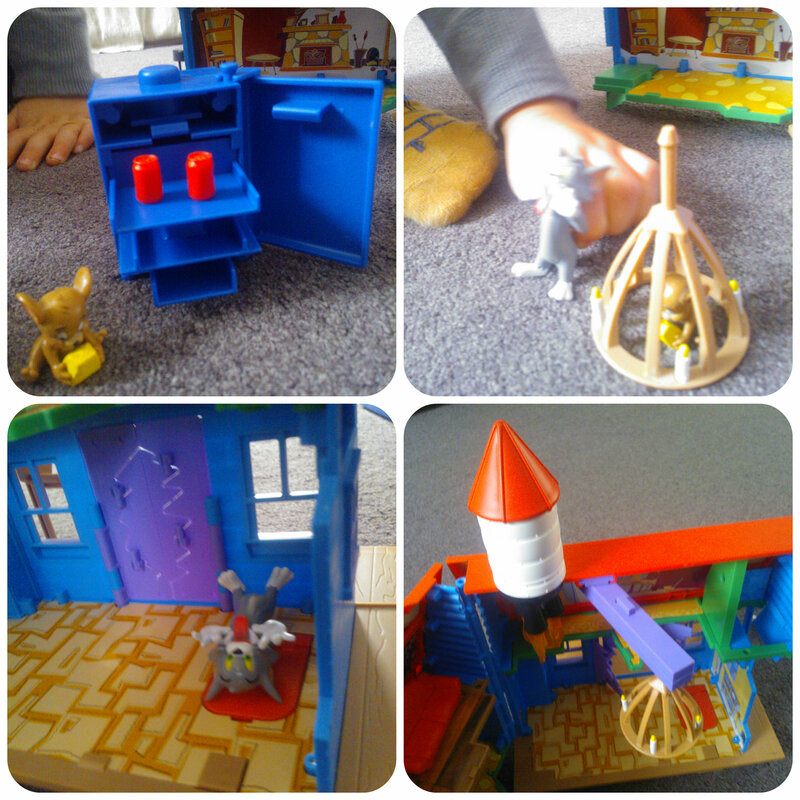 We’ve had lots of fun with the Tom and Jerry Tricky Trap House, more than I expected so for me it’s a been a good value toy that has encouraged a lot of imaginative play. I think any little Tom and Jerry fan would be happy to receive this if they enjoy the antics they get up to and want to replicate them. Mister B certainly gives this a big thumbs up! All reviews are my own and my family’s opinions and we received the playset in order to write the review. 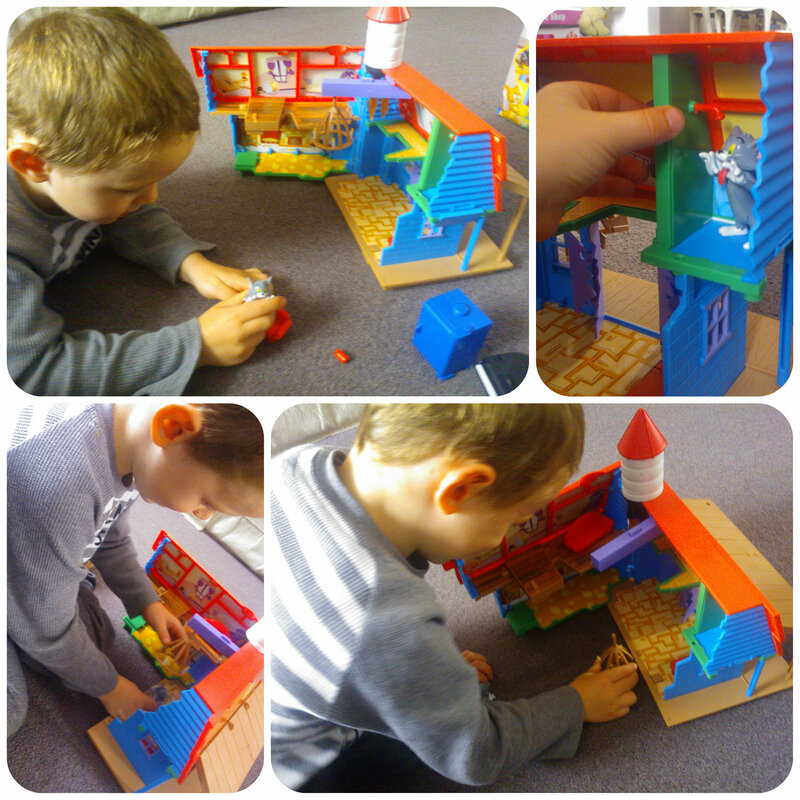 We were asked to review the Peppa Pig World of Playsets by Character Toys for izziwizzikids. Being a massive Peppa Pig fan, Miss M was thrilled when I told her we were going to be reviewing this toy. When she saw the box her eyes lit up in amazement and she couldn’t wait to get inside. 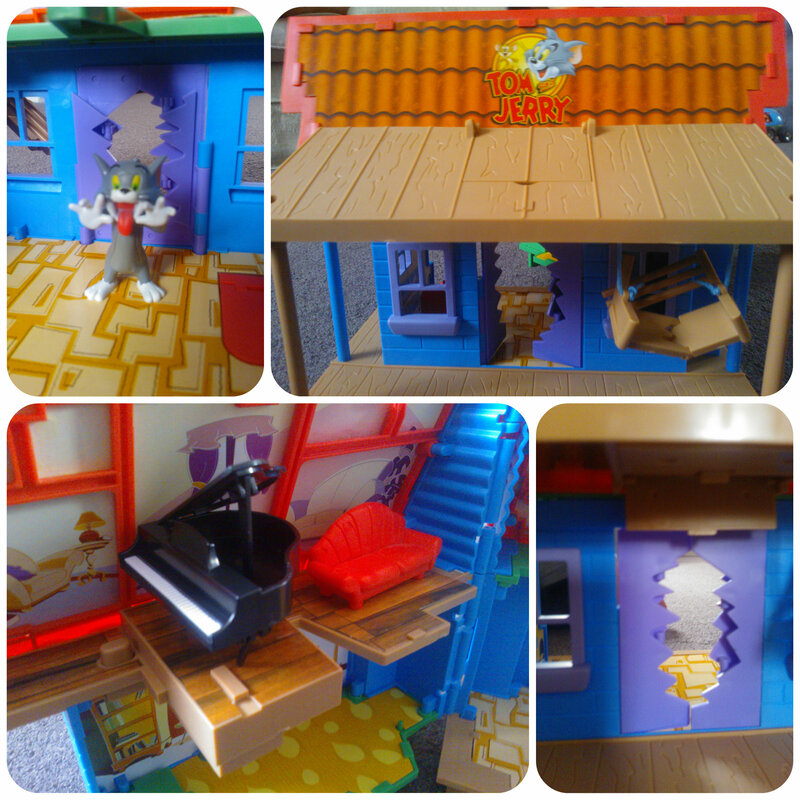 Out came the Peppa house with carry handle which opened up to find a further 5 buildings stacked inside. Miss M thoroughly enjoyed the process of unpacking the buildings (a bit like russian dolls) and happily lined them all up across the floor. And then the role play started – I was actually quite surprised at the conversation that I heard!! With the 1 Peppa Pig figure supplied there was a constant flow of chitter chatter from Miss M as Peppa Pig visited the cafe, bought an endless supply of cakes, then went home, had a bath, played with her doll’s house, then off to the vets, in and out all the opening doors as she went. Although the play houses are all plastic they are very sturdy and well built and will entertain little ones for houses with plenty of room for imagination. It would be nice to have some extra figures and accessories for the playsets so these were immediately requested by Miss M to go on her list to Father Christmas. (Shh – mummy may already have some bits stashed in the loft) so can’t wait to see the further play value and Miss M’s delighted face on Xmas day. The fantastic thing about these sets is unusual way they stack into each other creating a really compact, easy to store toy – fabulous!! 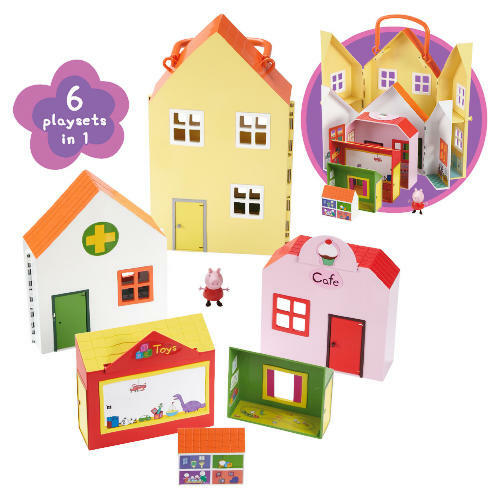 A delightful little set worth buying for any Peppa Pig fan this Christmas for hours of fun and entertainment.